Digital Out Of Home (OOH) is becoming increasingly popular as a way of getting messages across to potential customers in a fast & efficient way. Posters used to do this job but these are expensive to replace & change in each location. Think of bus stops & large format bill boards, all these are starting to become digital for the following reasons. A more professional message can be displayed, content can be changed centrally, more content can be displayed to capture the audience during the average view time and moving images always attract more attention. Outdoor and indoor: the digital experience becoming more a part of everyday life. OOH providers are moving more & more of their estate to digital screens and away from traditional 6 sheet poster advertising. We have seen this happen across N America in recent years and the London Underground moved its iconic diagonal poster frames on the escalators over to digital a few years ago and it was a huge success During 2016 the traditional UK ‘Bus Stop’ poster ad is also being updated to digital format. 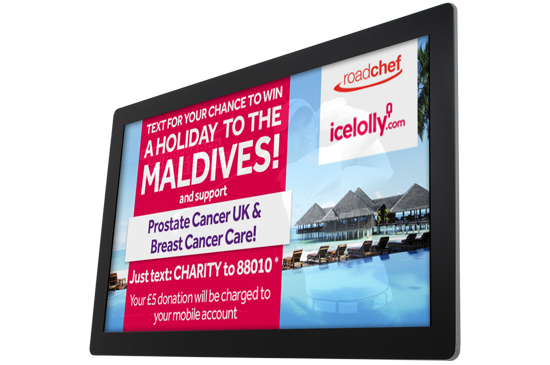 TOPAZ Digital is being used more & more in this environment and 2016 will see a roll out of large format digital screens into UK motorways service stations to provide a fully digital advertising medium. Ability to generate additional revenue through the selling of multiple advertisements in the ‘one space’ versus the limitations of traditional non-digital advertising. Dynamic advertising leading to increased recall of message and ability to charge increased ad rates. Ability to schedule campaigns and update remotely without the need to have anyone go to site to change out media. We can offer you a solution for ALL areas of your business… from Outdoor displays to Wall-Mounted displays and everything in between!